Nurses at Beebe Healthcare are being honored with The DAISY Award, a part of the DAISY Foundation’s national program to recognize the super-human efforts nurses make every day. Beebe presents the DAISY Award to nurses on a quarterly basis. Beebe’s September recipient is Matthew Chaffinch, an Intensive Care Unit nurse, who was recognized for the care he provided to a patient and his parents during the patient’s last days of life. 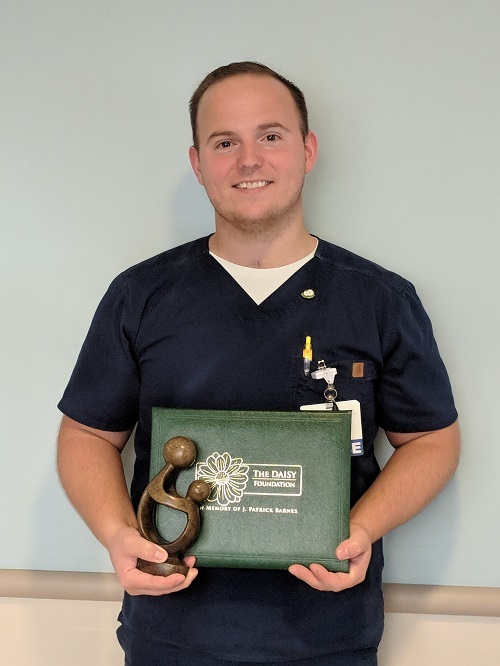 Matt was presented with a DAISY Award certificate and a hand-carved Healer’s Touch sculpture during a recent surprise ceremony. Each DAISY honoree receives the statue and the certificate, which commends the honoree for being an "Extraordinary Nurse." It reads: "In deep appreciation of all you do, who you are, and the incredibly meaningful difference you make in the lives of so many people."